Underwater view of small endangered Green Sea Turtle (Chelonia mydas) swimming with Remora Eel in the Pacific Ocean off the coast of Hawaii’s Big Island. Photographed March 2, 2008 using a Canon 1D III and 15mm f/2.8 fisheye lens. Exposure 1/250 at f/4.5. This entry was posted on Thursday, December 29th, 2011 at 5:49 pm. 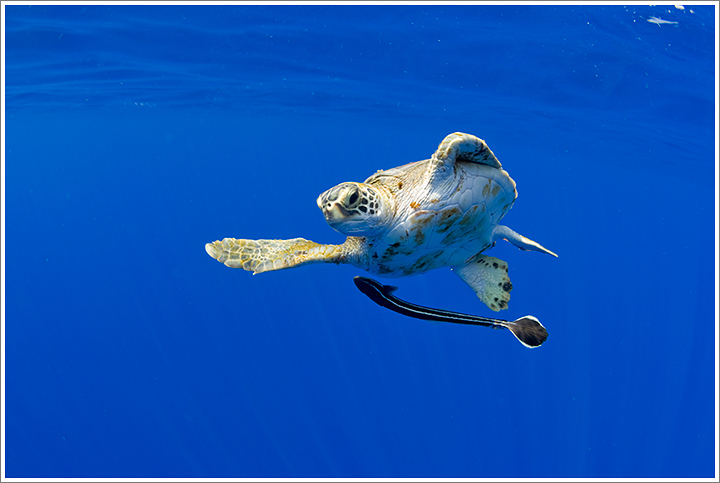 It is filed under Underwater and tagged with Endangered Species, Hawaii, Turtle, USA, Wildlife. You can follow any responses to this entry through the RSS 2.0 feed.